For over a decade, Texas Waste, Co. has been providing portable toilets and hand wash stations to Missouri City at a fair, ‘all in’ or ‘drive out’ price. We are a locally grown, family owned business that proudly hires, serves and pays forward to the great community of Missouri City. You’ll find our porta potties, hand wash stations and portable restroom trailers at local businesses, construction sites and special event venues in and around Missouri City. We own, maintain, rent and deliver our portable sanitation rentals personally to guarantee that your business or event receives the superior quality porta potty or hand wash station service that we stand by. Our reputation for professional-grade, clean porta potty rentals has made Texas Waste, Co. a trusted name in the community and the industry. That’s why porta potty brokers look to us as their supplier. We meet every expectation, every time. With a large stock of portable toilets, hand wash stations and restroom trailers, we can deliver to your business, construction site or special event on the same-day or at a pre-requested date and time. Keep business local and quality sanitation a top priority. Contact Texas Waste, Co. for your porta potty and other party rental needs. In 1890, two real estate investors by the names of R.M. Cash and L.E. Luckle bought four square miles of land southwest of Houston. They advertised this property in St. Louis, Missouri as a “land of genial sunshine and eternal summer.” This drew the attention of W.R. McElroy who, in 1893, purchased 80 additional acres near the original four. It was he who named the territory Missouri City. In later years, the land would be recognized for its wealth of natural resources like oil, salt and natural gas. In fact, in 1926 it was the first town in the country to make use of natural gas. If your looking for the best service and price for porta pots in Missouri City, TX we have them. 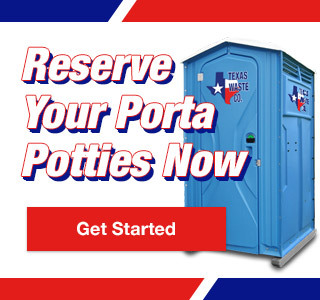 Missouri City – Porta Potty Rentals Available Now!